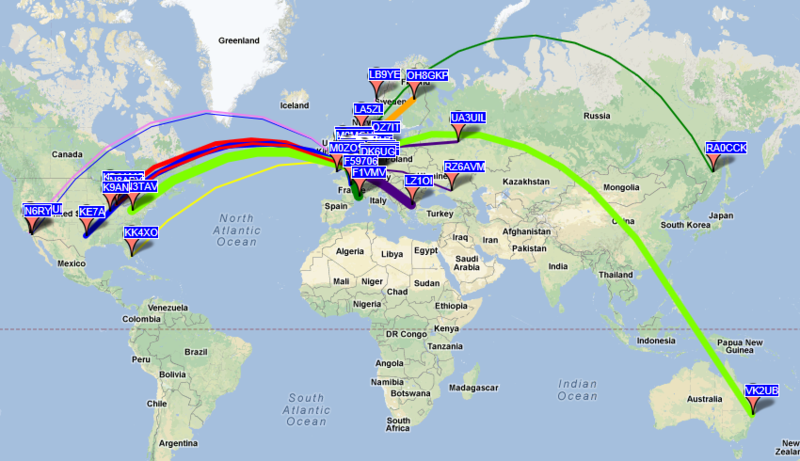 For the last few days I’ve been running WSPR on 15m with 5w out of my radio into the Hexbeam, pointing east in the morning and west in the evening. Here’s a map showing all activity over the last 24 hours. 15m is not a band that’s widely used for WSPR so there are nowhere near as many stations active on there as bands such as 20m, 40m and 30m but my reason for doing this was quite specific. This coming weekend is the CQ WPX RTTY contest and I’m going to be making a single band entry. I wanted to get a good idea of when the band opens in the morning, when conditions change from the east to the west and when the band finally closes. By running WSPR for a few days, it’s given me a good indication and hopefully I’ll know what to expect this weekend. CQ WPX RTTY is one of the largest RTTY contests of the year, last year I achieved a new G record for 15m and my goal this year is to improve on that score and beat my record. Prefixes are multipliers in the WPX contests and I’m confident that my Special Contest Callsign will attract some attention and give me a welcome boost. This entry was posted in Amateur radio, Contesting, Data, HF. Bookmark the permalink. Not sure I’d completely agree with that – Yes, it’s a low power mode but looking at the reports, most of them show people running 5 watts. Having said that, I do want to wind the power down a bit – I’ve just got the bits to knock up a box to give me an ALC voltage input to the radio to reduce the power below five watts.